Samothraki is a lush Greek island situated southeast of Thassos, in the Aegean Sea. If you want to get away from tourists and enjoy a different experience than the usual Greek islands it is ideal. The island rises up from the water forming a mountain in the middle, and is more of a hiking mecca than a lay-around-on-the beach mecca. Here, tourists come to enjoy the lakes and waterfalls and the lushness of its flora. 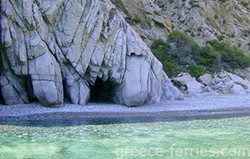 But Samothraki also offers several beaches which can be enjoyed after a full day of hiking. The most popular Samothraki beach is Pahia Ammos in the southern part of the island. It is a lovely, sandy beach, but it is not easy to get to. It lies about 15 km from the port town of Kamariotissa where the ferries come in. To get to the beach you must take a road which winds steeply up and will have you holding your breathe until you arrive at the beach. There are facilities at the beach-a restaurant and bar-and possible camping for overnighters. The beach offers protected swimming and is surrounded by cliffs, so it is well worth seeking out. Another beach, Kipos, is not as sandy as Pahia, but it offers more peace and quiet. There are few facilities here, except for a food stand. Kipos lies to the east of Pahia and can be reached by local bus. It offers bathing and snorkeling, and the water is clear and warm. One last Samothraki beach of note is Vatos beach, but it is quite difficult to get to as you must take a boat or hike from Pahia Ammos. It is similar to Pahia with lovely sand and beautiful scenery. Ultimately, in the northern part of Samothraki the road follows the coast closely; therefore, there are many areas that you can detour to and seek out your own private beach.